Just like the standard Ambassador, this is a supremely versatile head which will find favour with all types of drummer playing every style of music. Industry standard quality. Impressive strength and durability. Good warm tone. The WeatherKing Ambassador has been the industry-standard drum head ever since the plastic head was established in 1957. For toms this is true today, although some drummers employ a reinforced snare batter and a partially dampened bass drum batter. Drummers keep hitting harder and Remo has previously responded with the Emperor X, Powerstroke-X and Black Suede Emperor, which was, according to Remo, "A response to rock and metal players looking for a little warmer sounding head that still had the resonance, projection and durability Remo is known for." All this has led logically to the Ambassador-X. The coated Ambassador-X is a single-ply head, like the original Ambassador, but at 12-mil is 20 percent thicker than the standard Ambassador's 10-mil (1,000 gauge) - 0.012" as opposed to 0.01". It's a subtle increase, but the white coat looks denser and creamier than the standard Ambassador. Otherwise the head is identical in build with the same top quality Mylar exclusively supplied by DuPont. Sizes are limited to 8" through to 18" with no bass drums, but perhaps that is not surprising since even standard Ambassador bass drum heads are uncommon these days. We've always been Ambassador fans. They sound great when they're fresh and also worn in and starting to stretch, when you get more of the 'blam' factor. The new Ambassador-Xs retain these qualities with that familiar, open, generous tone. But there's a little more attack, warmth and richness to the sound. Tuned high you get a timpani-like ping with a full note and defined pitch. Tuned lower you get a fat tone with lots of 'thwack' followed by good sustain, particularly on the bigger drums. When we first played the 16" floor tom it resonated forever and we had to de-tune a lug to control it. There's certainly no shortage of sustain. 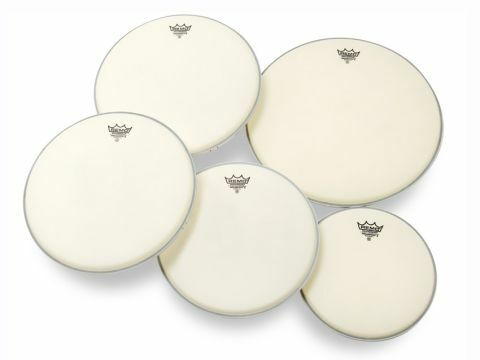 Many drummers who use normal Ambassadors on their toms require something tougher on their snare and resort to, for example, a CS batter. The Ambassador-X is that bit harder-wearing, prompting its use as a snare batter too. Rim shots ping out; ghost notes are clean and crisp. Using standard Ambassadors for the resonant tom heads feels entirely natural and we used a medium tuning, getting the best balance of sustain, tone and response. We tested these heads at a weekend charity festival where they were played outdoors in the open air. This is always a severe test since the sound can be cold and dissipate quickly, but the full-toned A-Xs performed as we hoped. Evans beat Remo to market with a 12-mil head, the G-Plus, which we loved. We're equally impressed by the Ambassador-X. You get the industry standard single ply head - the all-time proven all-rounder - with extra strength, durability and warmth.